Lately I’ve been really enjoying aromatherapy. 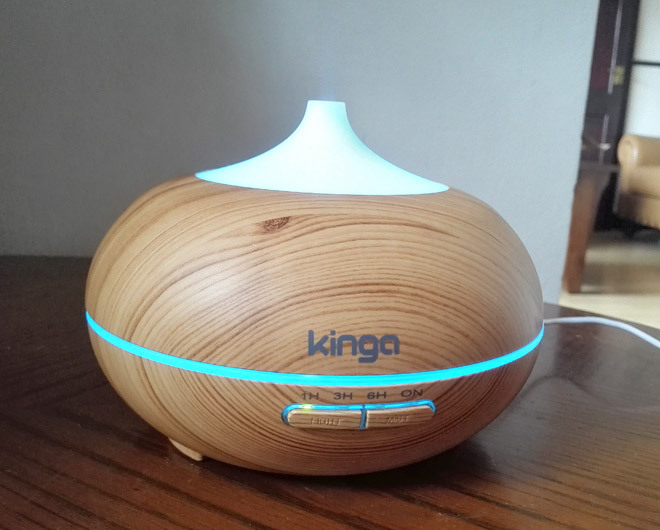 After spending hours researching essential oils and how to use them for health and well-being I was keen on trying them in my new electric aroma diffuser from Kinga. 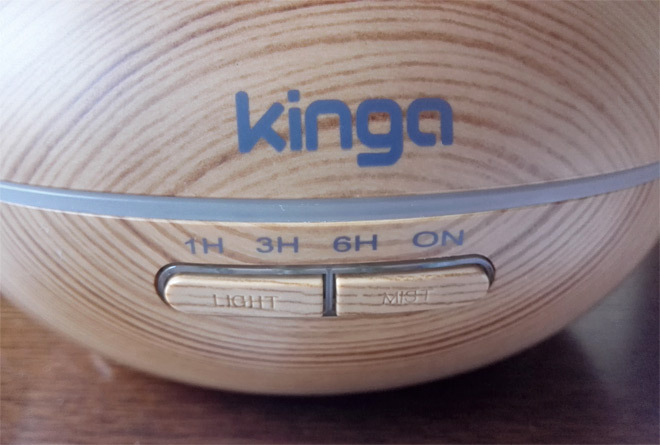 I’ve been using Kinga Aroma Diffuser for about a month now (the 300ml version) and I am ready to tell you all about it – what I love, what I don’t love that much and of course, what essential oils I’ve been actually using in it. If you love having your home smelling nice without the use of artificial air-fresheners, then the electric aroma diffuser is definitely something worth considering. There are different types of aroma diffusers out there but the electric ones make things easier as they consistently release the fragrance into the air. Since I’ve had Kinga aroma diffuser, I’ve been using it almost every day. I just love having it in my home office – it looks aesthetically pleasing and gets me going in the morning by releasing wonderfully scented mist. My favourite essential oil blend I am currently using in Kinga aroma diffuser is a few drops of peppermint oil with a few drops of eucalyptus oil. Both oils have quite strong scents which will wake up your senses and your mind, helping you focus, concentrate and get on with your tasks. I also love diffusing ylang ylang essential oil which is great for releasing negative emotions. Kinga aroma diffuser (300ml) is an ultrasonic essential oil diffuser and humidifier. It is really quiet and you can barely hear the mist coming out of the vent (you can hear a trickle of water though). It’s not only great for relaxation and naturally scenting your home, it also works great as a humidifier without the use of essential oils (perfect for winter). A diffuser which is also a humidifier – a win win, right? Tell me who doesn’t like 2 in 1 products? Not to mention that it can also be used for the light therapy as it creates lovely ambient lighting by regularly changing colours. 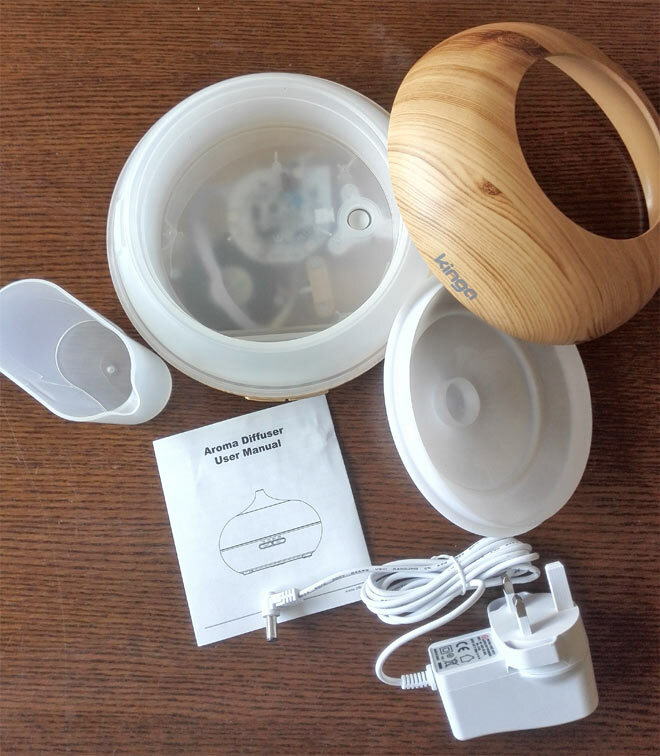 Overall, I found Kinga Aroma Diffuser easy to use but it’s worth reading the user manual which it comes with, just to be aware of all the options you have available. It’s also good to familiarise yourself with some safety guidelines. Kinga Aroma Diffuser is easy enough to assemble. In the box you will get a base unit, the cover with the vent unit and the power cord. To assemble, just plug the power cord into the DC input jack at the base of the diffuser and put the cover on top together with the vent unit. I found that the cover simply sits on top of the base unit and it’s not really locked into it (there is no click when you put the cover on top). I think it would be better if there was some kind of click – like that you would know that you’ve assembled it correctly. But it’s not a deal breaker at all. Before you plug the aroma diffuser into the wall socket make sure you pour some water into it (not more than 300ml) together with a few drops of essential oil, if desired. To switch it on, just press ‘MIST’ button. There are two buttons in front of the diffuser. One says ‘LIGHT’ and the other one says ‘MIST’. When choosing ‘mist’ you can decide whether you want to have it on for 1 hour, 3 hours, 6 hours or ON continuous. When water runs out the diffuser will automatically turn itself off. You can further play with the ‘mist’ button by hard-pressing it until you hear one beep – this indicates ‘high’ setting, or you can choose ‘low’ setting by holding the button until you hear two beeps. There is a subtle difference in the two settings but in both cases, the cool mist is coming out continuously (no option for intermittent mist). The other button, ‘LIGHT’ gives you an option to adjust the brightness – you can have it ‘bright’, ‘dim’ or ‘off’. To turn the light off, just hold the button until it goes off. This aroma diffuser uses ultrasonic principle which can atomize the water and essential oil in the water tank, and produces a cool, humid and fragrant mist. The fragrant mist works very well and in no time you will have a freshly smelling room with air actually feeling cleaner. The scent from essential oils will last for hours but if I use it the whole day I feel I have to add a few more drops of essential oils into the unit as the scent does fade over time (but this could be due to the quality of essential oils as well, but I am not totally sure). The diffuser is really quiet but I would personally not use it for the whole night in my bedroom. I am a light sleeper with every little noise disturbing me so that relaxing trickle of water you barely hear would probably bother me. But saying that, if you put the diffuser quite away from your bed, you may not hear that at all. The diffuser comes with a manual which is handy if you are not sure about something. In the manual you will find instructions on operation, maintenance and what to do in case of accidental leakage or if there is a problem. So you really have all the information you need to make the best use of this electric diffuser. 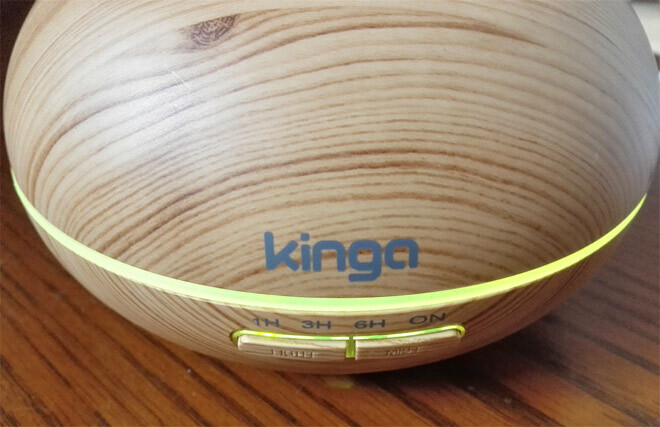 Kinga Aroma Diffuser is a lovely diffuser to have, it doesn’t only look good but it also performs well. I certainly have not been disappointed. If you are looking for a compact electric aroma diffuser, I am happy to recommend this particular Kinga Aroma Diffuser (300ml). You can buy it from Amazon here. Thanks for the great breakdown and review! This is deff one of my favorites.